A school bus driver hijacked a bus filled with 51 children on March 20 in northern Italy, and then set fire to the bus, threatening to burn the children who were on board alive, reported independent.co.uk. 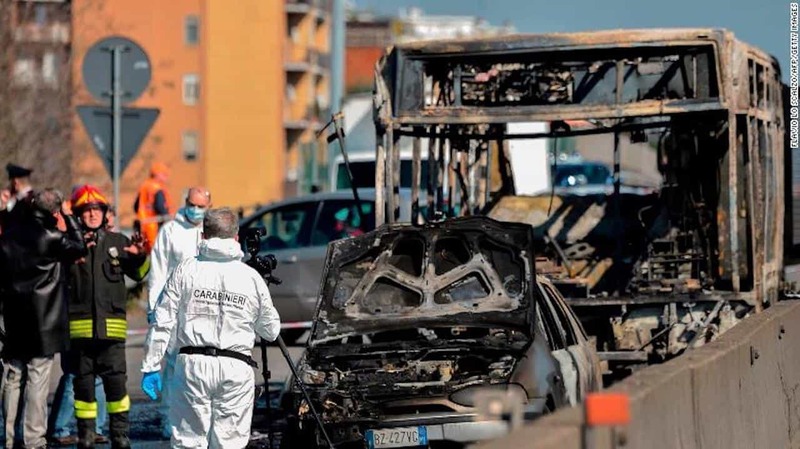 The bus was transporting two classes of school children from the province of Cremona to Milan. A previous article reported the teachers were ordered to zip-tie the students. One student, 13-year-old Ramy Shehata, of Egyptian origin, kept his phone hidden after the driver demanded the children’s phones, then secretly called his dad. The school bus went up into flames, but according to the article, police were able to rescue all of the passengers through broken windows before the fire destroyed the bus. No serious injuries were reported. The bus driver, Ousseynou Sy, 47, was charged with attempted murder, kidnapping, resisting arrest and arson. Previously, in 2007 and 2011, Sy was charged with drunk driving and sexual molestation of a minor, the article reported. In Italy, children who are born to immigrant parents have to wait until they are 18 before they can apply for citizenship. According to the article, government officials announced they would fast-track Shehata’s citizenship, due to his heroic actions. Student Killed After Being Pinned Between Van and School Bus in N.Y.